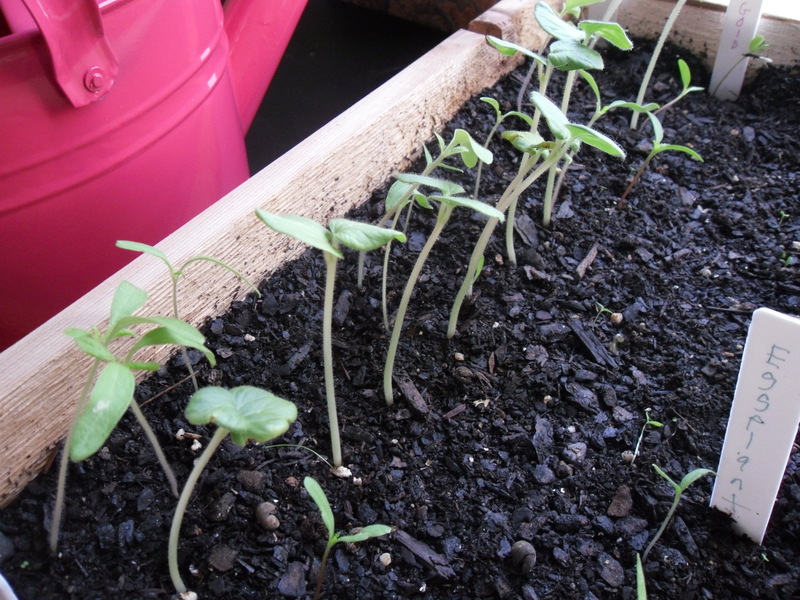 Word is there will be snow today, but I think this should be our last wave of cold weather, so the little plantlings will be outside soon, so they can grow big and strong. Here they are two weeks after going into the flats. The onions are ready to go out now, but I don’t have a bed prepared yet, I hope they can hold out for a few weeks. It will be so interesting to see how the celery grow. Looking at the little plants, I can’t figure it out. I guess I could look it up, but I don’t want to spoil the surprise. Last night I added lettuce and sunflowers to the flat. So the first flat is full. This weekend I am going to fill up the next 3 flats and then I will have all my seeds except the few (carrots, radishes) that I am going to broadcast. I am doing something new this year, testing the soil. I have never felt this was nessacarry, and have taken a survival of the fittest approach. But I was reading a book on growing berries, and it talked about how important it is to know what your soil is like to make good choices about where to plangt, and how to prepare beds, that I figured I would give it a try. I gathered one sample yesterday from the front yard. The way this works is you dig little holes about 6 inches deep in 5 to 8 random spots of your growing area. From each of those holes you cut a slice from the side with a trowel, trying to get about the same sample amount for each depth. You put all these samples in a clean plastic bowl (don’t use metal) and mix it up. Once well mixed you put it in the little bag, take it to your extension office, and they send it off for testing. I will do the same thing in the rose garden tomorrow and then drop them both off. I am doing this a little late so it might not be helpful to my planting, but it will be interesting to know. 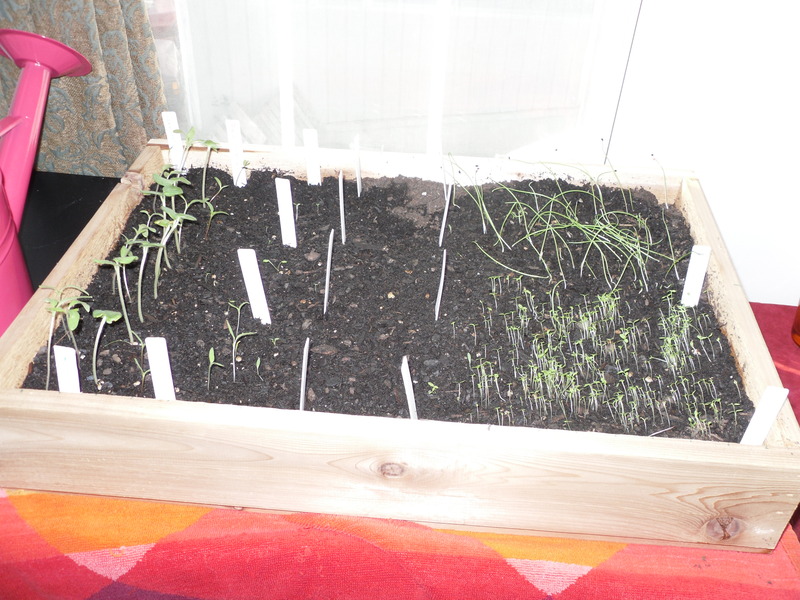 Yesterday I also set up an area in front of the living room windows to grow a wild flower/butterfly garden. I think the kittens will get a kick out of it. Those are their favorite window to sit it. This turned out to be a much more dangerous task than you would think, I tripped and got a very minor sprained ankle. It would have been funny recorded. I was walking, and then I was on the ground, with a little squeaky scream. My back was towards the walk way, so I put one put one arm behind me, and rested my head in my hand, all comfy looking. So by the time Jeff ran over to check on me, I was relaxed looking and said “Oh, I meant to do that, just needed a rest, right then” We also found a giant black widow. I don’t mind that they want to live here, but could they maybe hang out not on my plants (last year I picked one up on accident) or in my garden. Yesterday’s big girl was inside the hallow fake gray rocks that made up my front garden boarder. I was moving them to the butterfly garden. She was pretty sleepy from the cold, so she did not run out of it and bite us. Sadly, I made the decision to kill her. I did not kill the one I found last year. Our next door neighbors have a three/four year old, and I worry about her being outside and getting bit. I am pretty sure that if Puck, Jeff or I got bit, we would be able to go to the hospital and live, but I don’t know about a little kid, and I did not have time to go research it. I will research that today, so I can make a better decision next time. Where are you sending your soil off to for testing?